The days of, “Have a seat. What are we doing today?” are over for nail professionals who care about their clients’ health. Roughly 50% of Americans have some type of chronic illness, according to The Centers for Disease Control. The longer a person lives, the greater her chances of developing a chronic illness, which in turn increases the risk of infections and other complications. With this in mind, it’s essential that nail techs know if a client has any health conditions that might require a change to your standard service protocol. The first step is having — and using — a new client sheet. Techs are taught in nail school how and why to use a new client sheets, but in visiting salons, I’ve found fewer than 40% use them. And when they are used, most forms focus on contact information; few have sufficient questions about the client’s health. This is a safety issue for nail services. Without this information, the manicurist cannot determine the changes in protocols needed to service at-risk clients. Even if a nail technician has not received the advanced training required to know what precautions should be taken for a specific chronic illness, she can still incorporate some general precautions and protocol changes when she learns of a client’s chronic health issue. Performing services on at-risk clients includes ultimate infection control using high-level disinfection or sterilization of implements, plus the use of aseptic techniques aimed at eliminating pathogens. Aseptic techniques include every protective activity we perform, such as disinfecting surfaces, wearing gloves, and hand-washing by you and your clients. Strict adherence is a necessity as these clients are more susceptible to infection than healthy clients. Precautions may also involve being more gentle and refraining from the use of metal implements on some clients. For certain clients, massages or soaks may not be appropriate. For example, massage may not be advisable for clients with circulatory diseases, lupus, arthritis, and cancer. For some, it is a matter of lighter touch or avoiding certain areas, such as joints; others cannot be massaged at all. Clients with certain systemic illnesses cannot be soaked as soaking dries out their skin, which can cause complications of their disease. For example, diabetics who are insulin-dependent cannot be soaked due to a tendency toward heavy callusing and ulceration when the skin is dry. Clients with lesions, such as cuts or blisters, or suspicious coloration indicating an ulcer is developing must be referred to their physician or podiatrist — in fact, a physician referral is a good idea when you notice anything on the nails or skin that doesn’t look normal. Every salon should establish a relationship with a dermatologist, podiatrist, and/or general physician so they can refer those clients without their own provider. But this is not a matter of picking one at random. A salon can start by asking clients for recommendations of who their podiatrist and physicians are. After accumulating names, it is up to the salon owner or manager to take the next step, which may be personally calling on the physician and podiatry offices to ask questions about a referral relationship. A relationship with a physician or podiatrist can be an advantage for a salon, beyond just having someone to refer to in questionable situations. Friendly ones can be a resource for answers when technicians have questions, but even more, they may begin sending clients to the salon if they see it is clean and safe for their patients. Nail tech Denise Baich opened her studio, Pedicure Plus in St. Louis, Mo., without a single client and called on every podiatrist and physician close to her location. “I wasn’t going to just sit there and worry, so I developed a plan, a presentation, and hit the streets,” she says. Baich opened March 2016, and by September she was 60%-70% booked, unusual growth for a salon opening with no clients. At the one-year mark, she moved into a medical building and is now 80%-100% booked, mostly on referrals from the podiatry office next door to her and from other physicians and podiatrists in the building. 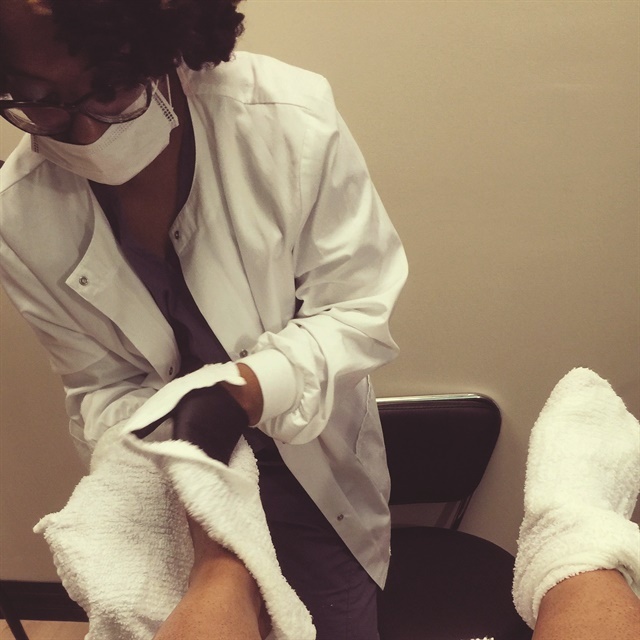 She believes her commitment to infection control, developed when taking the Medical Nail Technician Program, and her steadfast plan for calling on the physicians and podiatrists to tell them about it are the main reasons for her growth. No soak? What Do I Do? When the first article on “waterless pedicures” appeared in 1998, nail technicians gave it mixed reviews, saying that clients wanted to soak. Since then, however, waterless services have grown in popularity. Now techs are saying things like, “It’s faster,” “I don’t have to deal with getting water,” and “Sanitation isn’t an issue.” Also, with the growing elderly and chronically ill population, it’s becoming an important protocol for their services, both in manicures and pedicures. “I don’t and won’t soak, and my clients like — even prefer — my soakless services,” says Letisha Royster of Waterless ManiPedi and Nail Spa in Roswell, Ga. Royster believes this has been a positive for the growth of her salon. She is one of many salon owners who are converting all their manicures and pedicures to waterless. Perfect infection control and the accompanying aseptic techniques are not optional when it comes to nail care, even if the client is not at-risk, but especially for those who are. OSHA dictates nail technicians wear gloves for every service, masks when filing, and eye protection. Further, OSHA says we must assume every client has a contagious disease and that we must protect ourselves and others from the transfer of disease. Circulatory diseases (diseases of the vascular system), such as high and low blood pressure and varicose veins: the legs cannot be massaged. Swelling of the legs or feet: No massage, no soak. Systemic diseases, such as diabetes, lupus, and cancer: No soak. Joint and bone conditions, such as forms of arthritis or bunions: Gentle massage, avoid joints. Infections and openings in the skin, such as ulcers, athletes’ foot/fungus, irritations: Send client to their physician or podiatrist. A soakless pedicure eliminates the soaking of the feet and substitutes other techniques to cleanse and soften the skin. Note: Keep the feet wrapped in towels when not working on them. After handwashing, put on gloves. Perform an evaluation/analysis. Perform a dry file of heavy calluses. Cleanse the feet thoroughly with a gel cleanser using massage movements; use a brush with gel cleanser under the free edge of the toenails. Rub the cleanser into the feet. Trim and shape the nails. Apply scrub and rub into the feet focusing on the calluses. Remove the scrub with a warm, wet towel. Perform a massage, as appropriate. Reapply lotion. Dry between the toes. Cleanse the nail plates and polish the nails. Bring out homecare products and educate the client on their use. The same steps can be followed for a waterless manicure, except handwashing is substituted for the gel cleansing. Veteran nail tech Janet McCormick is co-founder of Salon Gurus (www.salon-gurus.com) and Nailcare Academy (www.nailcare-academy.com). Nailcare Academy offers advanced training in the care of at-risk clients.